The live oak (Quercus virginiana) is native to North America and is the state tree of Georgia. Easily recognizable with its broad canopy, twisting stems and often multiple trunks, this large tree can reach heights of 60 feet and widths of more than 100 feet, according to Edward F. Gilman, a horticulturist with the University of Florida. 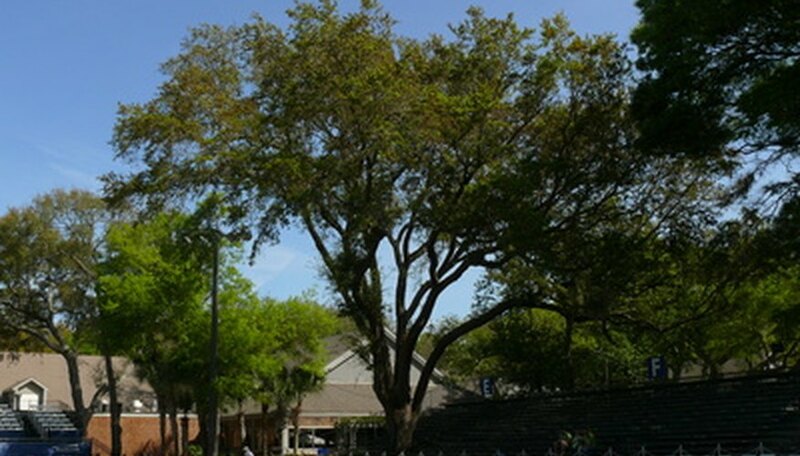 Although relatively hardy, live oak trees can still suffer from some diseases. Oak wilt is the most serious of the diseases that affect live oak trees. The disease is fatal. The first symptom is a barely noticeable paling of the leaves, which sometimes also crinkle up, wilt and begin to turn brown along the margins. The disease works its way from the outermost parts of the branches inward, and from the top of the tree down. Once a tree has been infected, it should be chopped down and destroyed. This disease spreads on the bodies of insects, infected wood or infected pruning tools. It is most prevalent in areas of east Texas, according to Gilman. Oak wilt can be prevented by using sterilized pruning tools and painting (sealing) pruning cuts to prevent insects that may carry the disease from being able to enter the tree through the wounds. Shoestring root rot is caused by a fungus that lives in the soil and attacks the roots of the live oak tree. This fungal disease moves up the roots and into the heart of the tree. Live oaks are very strong, however and can sometimes withstand the effects of this disease. Affected trees may have malformed, yellow leaves that drop early from the trees. There is no way to control shoestring root rot, although it can sometimes be prevented by planting healthy root stalk and making sure the soil has not previously hosted an infected tree. Leaf spot or blister is caused by a number of different fungi that form galls or spots on the leaves. These fungi spread through water and are often troublesome during unusually warm, wet spring weather. Spots can appear as raised, greasy lesions, tiny orange or black dots or brown spots with white borders. Sometimes, the spots drop from the leaves. In other cases, the leaves may fall from the tree. Although unsightly, these fungal disease are not fatal to the trees they infect. Some leaf spot diseases can be prevented with the use of a fungicide in the spring, although many live oaks are too large to be completely covered. Rake up dropped leaves and dispose of them so that the fungus does not overwinter in the soil.